Why is this? I remember it being possible in the past to upload an animated gif image to a question (even though I have never done before, but just seen others questions with animated images which I assume to be gifs), so is there no long any way to do it? But why do I have the manually do this? Why can't the system do it? The problem is that the image is too large. When you are adding an image to your post, even if you choose a link, images are always uploaded to stack.imgur.com. SE and Imgur have some form of friendly agreement where images are hosted till the end of time, and never expire. The only way it can work, is the way you actually did it. Insert the image manually without uploading it to imgur (i.e. without using the Editor's button to insert an image). 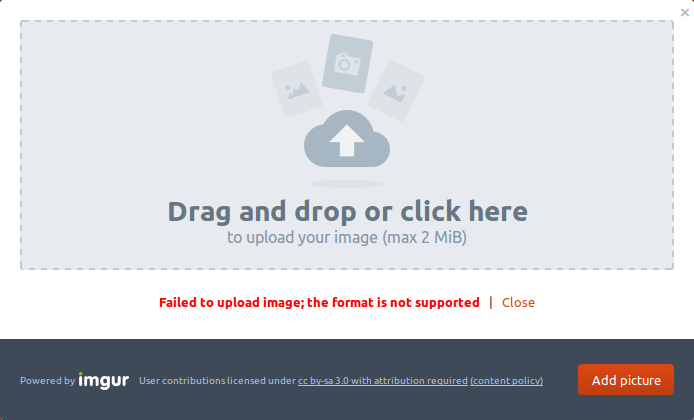 Keeping that in mind, please do not insert large images to your posts, it slows down the time it takes to load the page, and people who have a small quota would be really mad when large files are being downloaded. I suggest just posting a link to the image, so people who want to see it, would need to click the actual link. The file is almost 3MB. Maximum upload is 2MB.